Published in Rafu Shimpo, April 13, 1967. Japanese Vice Consul Miyoko Iida presents a framed Mt. 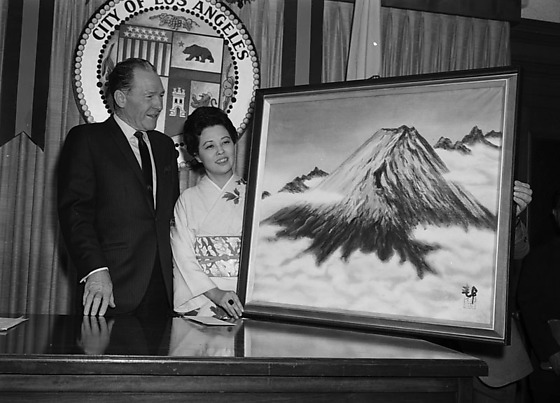 Fuji sumie painting by Dr. Tagayasu Inagaki to Los Angeles Mayor Sam Yorty in his office in City Hall as part of the Wakayama amity project with foreign nations, Little Tokyo, Los Angeles, California, April 12, 1967. Japanese woman in kimono stands between Caucasian man in suit and large painting of snow-capped mountains surrounded by clouds. Also includes six other men standing to left of Yorty and woman. Los Angeles City emblem and American and California flags in background. Typed on original envelope: Mt. Fuji Painting Presentation to Mayor. The painting was 39 x 34 in. and painted in the nanga technique on rice paper. It was added to the City's permanent collection.